From left: Posh, Kurant Twist, Mint Frost, Stellar, Nail Hardener and Base Coat, Nail Polish Remover, Cuticle Sanitizer, and Kwik Dry with cuticle conditioner. 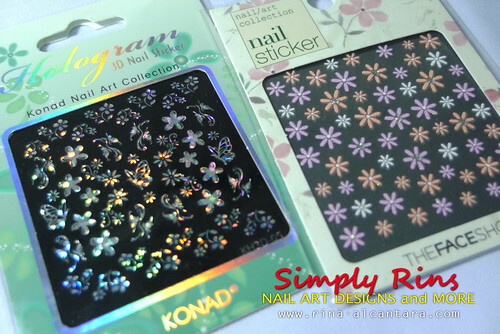 On the left is a set of Hologram 3D Nail Stickers from Konad. On the right is a set from Faceshop. 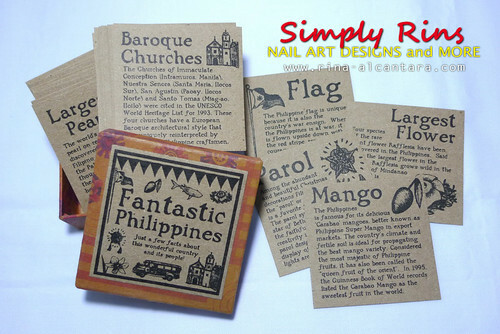 A small box containing a few interesting facts about the Philippines. Hopefully, you'd enjoy reading them and eventually see the beauty of our country. I'll be waiting for your creative entries until 11:59pm November 05, 2010 (GMT +0800). For instructions, please visit Celebrating One Year With A Nail Art Contest. 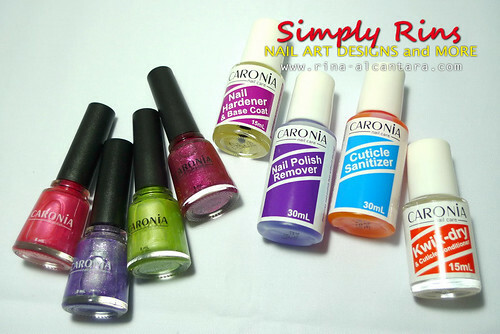 Disclosure: All Caronia products included for the giveaway were provided by Caronia Philippines. Nail art stickers were provided by my sister. th box with info about Philippines is a great thing! Oooh, my first entry to a nail art contest ever! Exciting to see all the other designs.